ONE OF BRITAIN’S BIGGEST BASEMENTS! The spectacular listed façade of a period property was carefully preserved as part of a major refurbishment which includes the construction of new, high specification apartments in one of London’s most exclusive residential areas. At the time of construction, this project was believed to be the UK’s largest domestic basement. The three storey habitable space below ground was retrofitted under the existing property, and extends beneath the new build adjacent luxury apartment blocks. Pre-design meetings between all parties, including Triton’s CSSW qualified technical team, led to the specification of a combined waterproofing system using Type A, B and C forms of waterproofing (as defined in BS8102:2009) to waterproof all the structural elements below ground level. Key system design considerations included heavily clayed ground with the high risk of perched water tables, and water running off at ground level – during inclement weather – from the neighbouring sports field. 3,000 m³ of concrete, made watertight by the addition of Triton’s BBA certified TT Admix, was specified to line the basement. Approximately 6,000 Lm of Triton’s TT Waterstop, (hydrophilic strip), was embedded in dual purpose TT Swellseal Mastic S2 in rebated joints within the concrete to seal all the critical construction joints and concrete interfaces below capping beams and in kicker joints etc. 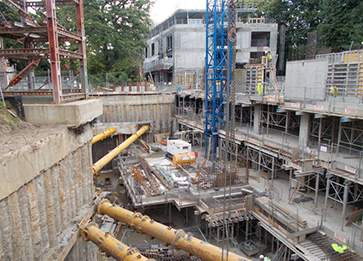 The second part of the twin waterproofing approach involved the installation of a BS 8102:2009 Type C system using approximately 4,000 m² of BBA certified Platon P8 cavity drain membrane to the liner walls and deeper studded BBA certified Platon P20 membrane to all the basement lower level slabs. Triton’s Aquachannel drainage conduit, with rodding eyes installed at appropriate intervals to the perimeter and linked to various pumping stations, completed the drained Type C system. Intermediate slab bunds were waterproofed with Triton TT Vapour Membrane, a liquid applied Type A system, which was also applied in a 1 metre band under all earth retained soffits to lower the associated risks at these critical junctions. BS 8102: 2009 and NHBC Guidelines both stipulate the importance of appointing a waterproofing specialist at the inception of any structural waterproofing design, and preferably one with experience of all types of system. Using Triton as a single source of all waterproofing materials, as well as for the provision of technical support, ensured system compatibility and a level of expertise that reduced risk to the lowest possible level. 4,000 m² Platon P20; 4,000 m² Platon P8; 1,000 Lm AquaChannel; 160 x Rodding Eyes; 1,000 lt Triton TT Vapour Membrane; 12,500 kg Triton TT Admix, 6,000 Lm Triton TT Waterstop, 2,000 tubes Triton TT Swellmastic S2.